In some situations your web developer will ask you to change your DNS records so that your web site operates from another platform. They will provide you with an IP address and ask that you update your DNS records. The following guide will show you how to change your A record, so that your web site points to another platform whilst leaving your email to continue operating within your AUSWEB account. Replace mydomain.com.au with your actual domain name. Click on Edit button again to save the changes. 4. Click on the Home link in the upper right hand corner. This will return you to the main cPanel screen. 1. Go to the Domains section and click on Advanced Zone Editor. 2. Write down the current IP address, you will need to refer to this in the last step in this guide. 3. Remove the current IP address and replace it with the one provided by your web developer. You now need to adjust your email record so that it continues to point to your AUSWEB account. 1. Locate the record called mail.yourdomain.com.au and click on the Edit button. 2. Change the Type of Record to A. 3. 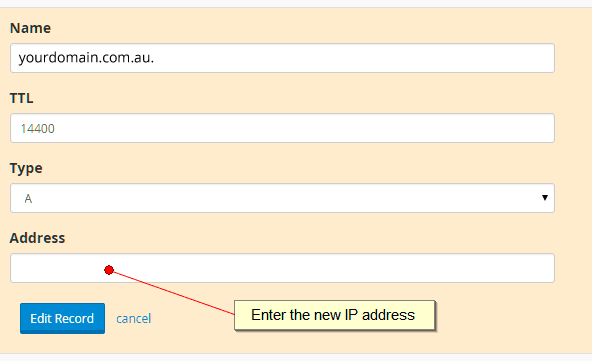 In the Address field enter the IP address of your AUSWEB server. This was the IP address that you previously wrote down earlier in this guide. 4. Click the Edit button to save the changes. Please allow 12-24 hours for these change to propagate across the Internet. After this period of time has passed your web site will begin to operate from its new location, with your email still being received by your AUSWEB hosting account.